Halfpipe skiing: perhaps the most counter-intuitive of all the things you can do on skis. Big, icy walls that you’re supposed to ski directly towards at high speed, be launched straight up into the air by, and somehow land back on, all while traveling on the same plane. Yes, it’s a bit strange—but when a rider nails that transition just right and flows through the pipe like water, it’s also one of the most elegant things in the sport. 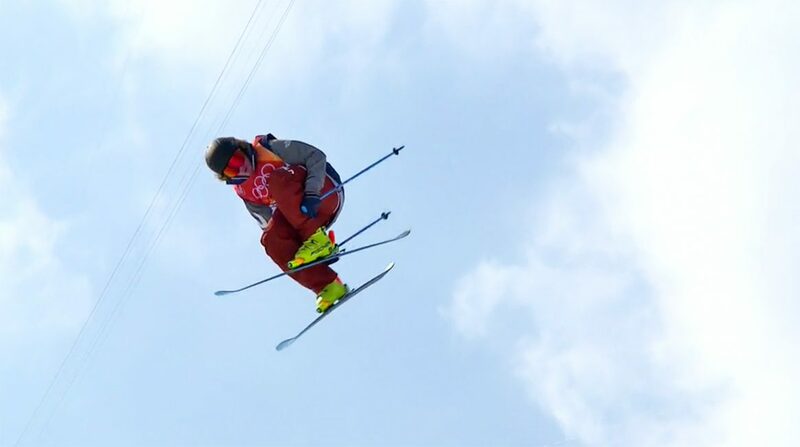 We witnessed that kind of elegance today at the men’s Olympic halfpipe skiing finals in Pheonix Park, South Korea. Twelve of the world’s best dropped into the pipe. Some emerged bloodied and bruised, others in triumph. And after the last double had been stomped, it was David Wise on top of the podium. David Wise, “three-peat plus one” X Games champion. David Wise, Olympic defending gold medalist. David Wise, family man and now, quite undisputedly, the best halfpipe skier in the world, with a legacy that won’t die out anytime soon. It didn’t come the easy way today. Wise had to fight for it, crashing on two runs before finally putting together the current Holy Grail of pipe skiing—double corks in all four directions, all with big amplitude and grabbed throughout. His score of 97.2, the highest of any ski pipe run in recent memory, was the high point of a tumultuous final that saw more than its fair share of huge action. Best halfpipe contest ever? It’s up there in the running, for sure. Wise’s teammate Alex Ferreira claimed the silver with a groundbreaking run of his own: five doubles, left and right, one switch, with a score of 96 that would have won most other pipe contests. And Nico Porteous from New Zealand shocked just about everybody, including himself, and wrested a bronze medal with the first five-double run of the day and possibly ever, totally clean and including a double cork 14 tail that ranks among the most technical tricks landed to date in the pipe. 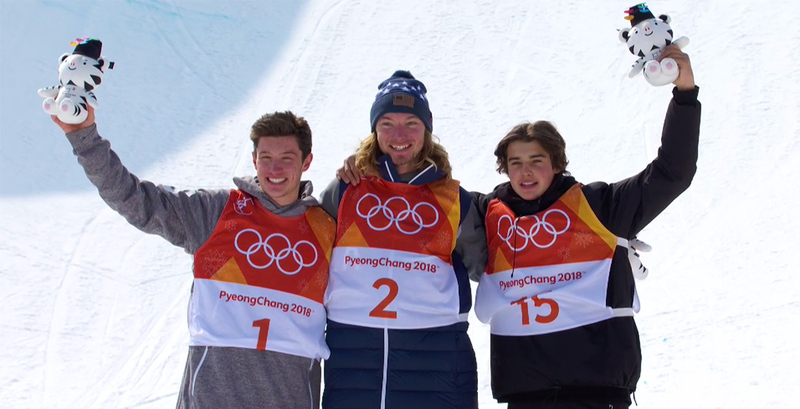 Wise, Ferreira, Porteous—a fitting podium for one hell of a halfpipe event. Keep reading for a run-by-run breakdown, which is really the only way to do this thing justice. Austrian Andreas Gohl, a dark horse if there ever was one, kicks things off by crashing on a right double and tearing the heelpiece of his binding out of the ski in the process. Nico Porteous comes out swinging and puts down a big run that’s a harbinger for what’s to come—four doubles including one switch, moderate amplitude, all stomped and grabbed. Score in the low 80s, and he’s pumped and ready for more. Thomas Krief lands low on an alley-oop double and takes a brutal crash. Medical staff come down to help, but he gets up and skis out, obviously in a lot of pain. Unshaken by Toto’s crash, Noah Bowman steps up and lands three switch doubles, all with signature style. Only problem for the judges? They’re all to the left, and apparently his two rightside spins—360 stale on the first hit and a 1080 blunt at the bottom—aren’t stylish enough to make up for their lack of being doubles. (Note to the judges: they just might be.) Still, he posts a very respectable 89.4—a great score, but hard for him to improve on. Wise loses a ski on a huge right 1080, Mike Riddle puts down a safety run, and Kevin Rolland lands backseat on his first-hit switch double. Then Team New Zealand lights up the pipe again: Beau-James Wells starts off with a massive switch 7 tail before pounding out four forward doubles left and right, scoring an 86. And it’s clear there’s still more to come. Torin Yater-Wallace lands backseat on a switch double and eases off, but Alex Ferreira steps up with a right double cork 12, left double cork 10 a la Rolland, switch right 7, left dub 12 and a down-the-pipe flatspin 9, pushing the scores up into the nineties. Top qualifier Aaron Blunck struggles a bit with execution and is scored in the low 80s, and it’s still anyone’s prize for the taking. Gohl can’t get the right double flair again. 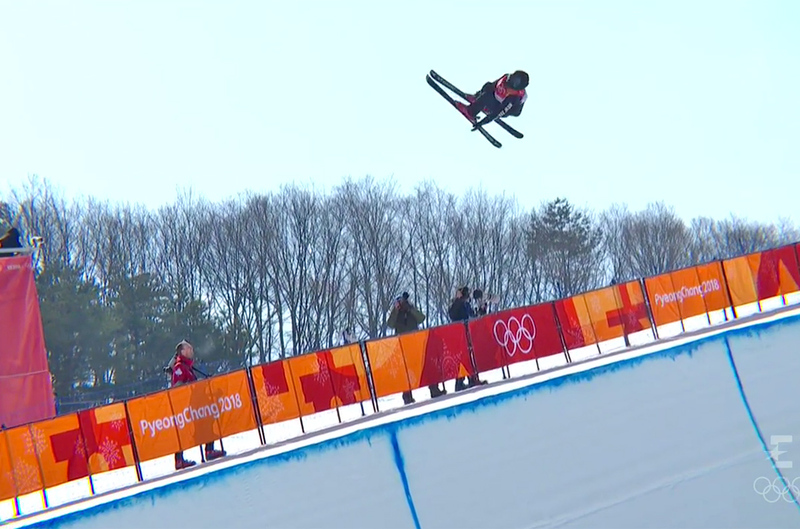 Nico Porteous steps up big with what turns out to be the bronze-medal run: left double 14 tail, switch right 900 mute, switch left double 1080 safety, right double 1260 safety, left double 12 safety and an alley-oop double flat 900 to cap things off. 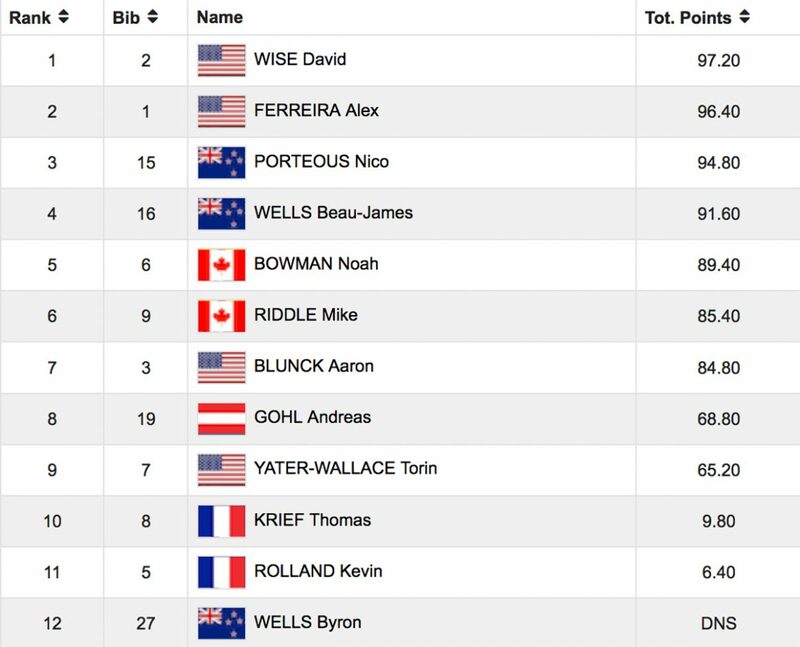 That’s the first run with five doubles in the contest—maybe ever?—and quite possibly the most technical pipe run done (yet) in skiing. The score comes in: 94.8, and he’s in first place for the time being. 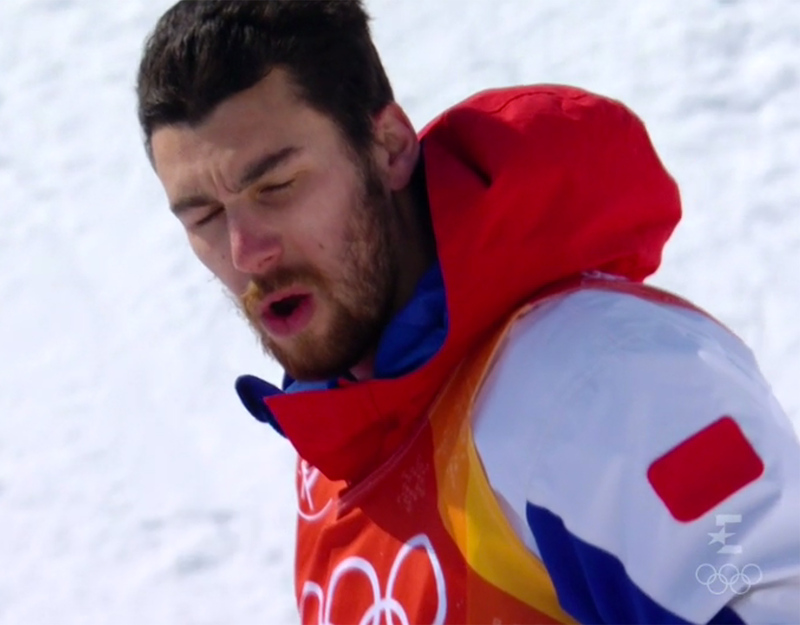 Watch Nico Porteous’ bronze medal run here. Nico may have averaged "only" 3.3 meters on his run, but for a guy his size that's plenty big. A litany of miscues follows: Bowman can’t hold on to the landing of his first hit, Wise can’t land his switch right double, and Riddle goes down on a fresh new left double 10. “One more!” he says. Rolland can’t land his switch double again—he wants the gold, but it’s slipping away. Wells tosses his run after missing the grab first hit, and Torin Yater-Wallace goes for broke with a huge run but simply runs out of pipe at the end, crashing out of a double flatspin where there’s no pipe left. It’s left to Alex Ferreira to put down the biggest run of the second round and second-biggest of the contest—adding a switch right double to his run to join Porteous in the five doubles club. His score of 96 will be hard to beat, but there’s a man here who can do it. For the moment it’s not Aaron Blunck, who falls into the wall after his first-hit cork 7 cuban. It’s the final run and this pipe is all shook up, with unheard-of runs already landed. Gohl pulls it together and lands a run to take home. Nico Porteous, currently in second, opts out of taking his run altogether, and surfs down the pipe. It’s a bold move—a bit controversial on the one hand to not “go for the gold.” But on the other hand he’s saying, “there’s no way I can top the run I just landed,” and that says something too. Bowman can’t get his switch double 12 around, and remains in third for now. Going all or nothing on his third and final attempt, David Wise finally puts it all together in a monumental run: switch left double 900, left dub 12 mute, right 1080 tail, switch right 900, and right 12 mute. It’s four doubles—one less than the others—but spun in all four directions. The judges’ verdict comes down at 97.2, and Wise has delivered the clutch performance of a lifetime. Watch Wise’s gold medal run here. Guy (high) in the sky: David Wise. Can anyone unseat the king? It doesn’t look like it. Riddle goes too deep on an alley-oop flatspin and will have to be content with sixth. Kevin Rolland takes a very, very hard crash, the same one as Joel Gisler in the qualifiers, landing on the deck on a first-hit switch dub. It’s a terrible slam that would break anybody else—but incredibly, Rolland gets up and skis away under his own power. What an animal. Beau-James Wells closes out a very successful Olympic appearance with a run featuring five doubles of his own, which at 91.6 is somehow only good enough for fourth place behind Wise, Ferreira and Porteous. He gives Nico a hug at the bottom. Torin, still all-in, pops too early on his left 1080 and decks out, crashing hard. A potential gold medalist and undisputedly one of the world’s best is ushered out in ninth place. Only Ferreira and Blunck remain. Ferreira isn’t shy about trying to step up his run. He shoots for the moon and stomps his run again massively, going over 16 meters on his highest hit and averaging over 5 meters. It’s got five doubles, but still not Wise’s “all four directions” completion on the dubs. His score is upped by .6 points. And Aaron Blunck, the top qualifier, lands a bit off on his switch right double, enough to keep him from improving. Watch Alex Ferreira’s silver-medal run here. It’s Wise, a champion on his pedestal, at the top of the podium. Ferreira to his right, grinning like a goon and looking up in admiration at the boss standing above him—for now. And Nico Porteous to his left, looking slightly dazed. The Olympics have now come to an end for the freeski contests in slopestyle and halfpipe, and it’s been one hell of a show on the sports biggest stage. Congratulations to all the victors, and well wishes to all of the other competitors, and those heading home with bruises instead of medals. Maybe, in four years you’ll get another shot. 2018 Olympic Men's Ski Halfpipe final results. Read a recap of the qualification round here. Read the results of the women’s Olympic halfpipe contest here.